There is no series of silver for sale from the United States Mint as diverse as the America the Beautiful collection. Launched in 2010, the ATB Series features five new designs each year and runs the course of 11 years with 56 designs planned before it reaches its completion. 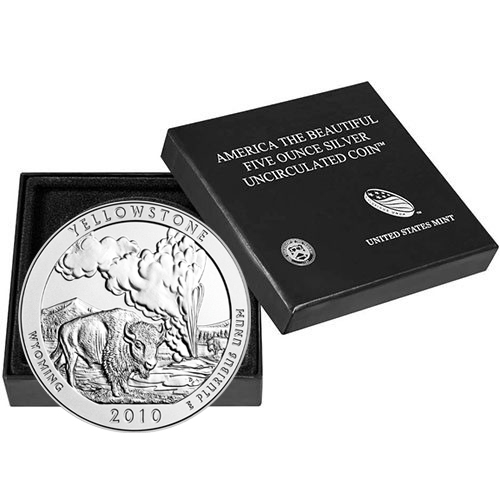 Today, 2010-P 5 oz Burnished Silver ATB Yellowstone Silver Coins are available to you online at Silver.com. Coins ship to you inside of original US Mint boxes and include a Certificate of Authenticity! Second coin to release in the ATB Series from the US Mint! Availability of burnished coins is limited! On the obverse is an effigy of President George Washington. The reverse includes the image of a bison at Yellowstone National Park. Celebrates the oldest national park in the country! Issued on behalf of Wyoming. The America the Beautiful collection includes one design representative of each of the 50 states, five overseas territories, and the federal district in the United States. The designs run the gamut from national parks and national lakeways to historical battle sites and precious monuments to the nation’s history. All 2010-P 5 oz Burnished Silver ATB Yellowstone Silver Coins available to you through this listing comes with its original United States Mint display box. The coins are safely housed in the satin-lined boxes and come with a Certificate of Authenticity. Yellowstone National Park was established in March 1872 during the administration of President Ulysses S. Grant. The establishment of Yellowstone marked the first ever national park in the United States. The park is well known for its wildlife and the geothermal activity of various natural features. Chief among these is Old Faithful. 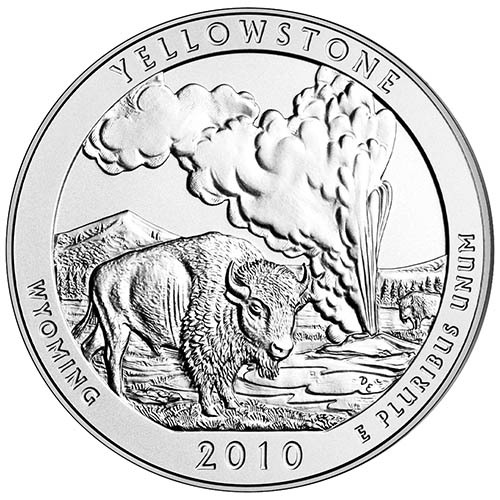 On the reverse side of the 2010 Burnished Silver ATB Yellowstone Silver Coin, you’ll find the image of a bison standing in the foreground. One of the many wildlife species that call the park home, this bison is standing calmly in the foreground as Old Faithful releases a blast of steam in the background. 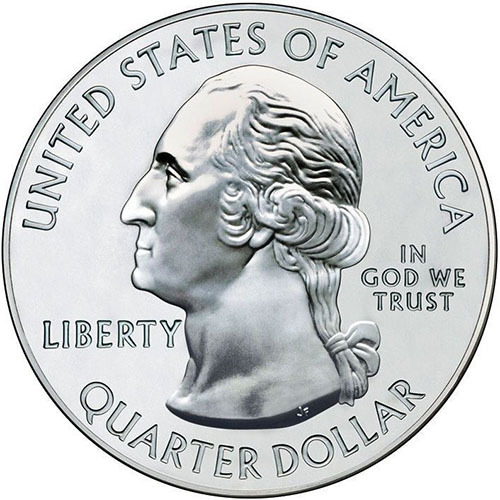 The obverse of all coins in the Silver ATB Series includes the image of President George Washington. The nation’s first president is featured on this side in left-profile relief in the same design currently found on the nation’s circulation quarter. All 2010 Burnished Silver ATB Coins have a vapor-blasted finish that gives the coins a matte appearance with a duller luster than their bullion counterparts in the series. While the bullion coins are issued at the West Point Mint with no mint marks, these burnished coins come from the Philadelphia Mint with a “P” mint mark. Please feel free to reach out to Silver.com with questions at 888-989-7223. You can also connect with us live online through our chat and email features.